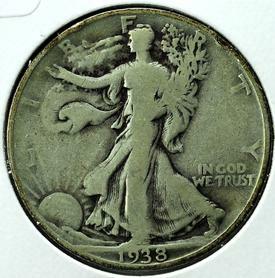 1938 D Walking Liberty Silver Half Dollar. The year was 1916 and major changes were taking place in the United States not only socially and historically but in coinage too. During the previous decade new designs had been used on six different U.S. coins, supplanting the more typial sedate 19th-century portraits that were standard on US coinage. In 1916 three more old-style coins the Barber silver coins were being retired in favor of new style coins. Outside artists not on the staff of the U.S. Mint had furnished new designs for the six previous changes, and in 1915 three noted sculptors Hermon A. MacNeil, Albin Polasek and Adolph A. Weinman were invited to submit designs for the three new silver coins. Weinman ended up being awarded two of the three coins, the dime and half dollar, with MacNeil getting the quarter. Weinman chose a full-length figure of Liberty striding toward the dawn of a new day, clad in the Stars and Stripes and carrying branches of laurel and oak symbolizing civil and military glory on the obverse and on the reverse a majestic eagle perched on a mountain crag, wings unfolded in a pose suggesting power, with a sapling of mountain pine, symbolic of America, springing from a rift in the rock. These strongly patriotic themes resonated perfectly across a nation then preparing to enter World War I. Weinman placed his initials (AW) directly under the eagle’s tail feathers. Over 485 million Walking Liberty halves were made between 1916 and 1947, but they were issued only sporadically during the 1920s and early ‘30s, none being minted in 1922, 1924-26 and 1930-32. These were coins with substantial buying power, enough to buy a loaf of bread, a quart of milk and a dozen eggs in the early ‘30s, so it didn’t take huge quantities to fill Americans’ needs, especially after the Wall Street crash plunged the nation into the Great Depression. Mintages were particularly low in 1921, and the P, D and S half dollars from that year all rank among the major keys of the series. Other scarce issues include the 1916, 1916-S, 1917-D and S (with the mintmarks on the obverse) and 1938-D. Brilliant proofs were minted from 1936 to 1942, totaling 74,400 pieces, and a very few satin-finish proofs were struck in 1916 and ‘17. The Franklin half dollar succeeded the Walker in 1948. But 38 years later, in 1986, Uncle Sam dusted off the Weinman design for the obverse of the one ounce American Eagle silver bullion coin, which has been minted annually ever since.